So, just a heads-up, this post contains absolutely no substance of any kind. I ran across this image on one of my many journeys across the interwebz, and I can't decide whether this is one of the most adorable, or terrifying things I have ever seen. 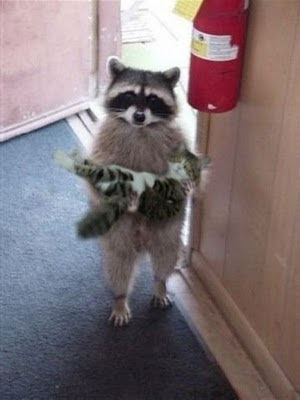 On one hand, I picture that cute little bandit delivering a lost kitty to its owner. But there's that other side of me that thinks he probably ate it... And judging by that poofed tail, Kitty is pissed.